A frustrated young writer discovers a surprising redemption when he moves back in with his dying father. 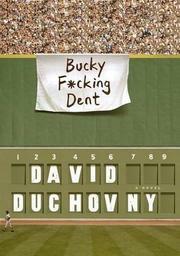 Duchovny (Holy Cow, 2015) follows up his whimsical debut with a far more substantive coming-of-age novel that started life over a decade ago as an unproduced screenplay centered on the infamous 1978 American League East tiebreaker between the Yankees and the Red Sox. Our introduction to this well-captured corner of Americana comes from Ted Fullilove, an Ivy League graduate who largely wastes his potential by smoking pot, tossing peanuts at Yankee Stadium, and puttering around with the Great American Novel. When Ted learns that his long-estranged father, Marty, is dying, he moves back in with the cantankerous old man. Marty is a throwback to another age, a former adman with a secretive past revealed when he asks his son to read the journals he wrote as a younger man. As Ted spends more time with his father, he develops a grudging respect for the profane Marty, whose belligerence belies a whip-smart mind and a deep love for the son he calls “Splinter.” Ted even gets surprised by his own romanticism when he falls for Mariana, a caretaker who warns Ted, “Death is not a story; it can’t be faked out. Death is real. You can’t really keep your father safe.” There’s a comic angle here, too. Marty’s health plummets whenever the Red Sox lose, so Ted mounts an ambitious campaign to fake a winning season with the help of Mariana and Marty’s elderly buddies. A truly funny moment comes later when Ted introduces Marty to the merits of marijuana. Readers who enjoy the story told here would be well-served by seeking out Duchovny’s 2004 directorial debut, House of D, which shares many of the same assets. Duchovny riffs heavily on familiar themes here but still deftly portrays bittersweet nostalgia without lapsing into saccharine theatricality. A sentimental, staccato love letter to baseball, fatherhood, and the passage of time.